Classics 3 Designed With The Family In Mind. The First Level Offers A Sitting Room Entry, Office/Den, Formal Dining, Family Kitchen And A Living Room That Opens To A Spacious Covered Lanai. The Second Level Opens Up To A Family Gathering Area With Access To The Master Bedroom Suite And Three Other Bedrooms. 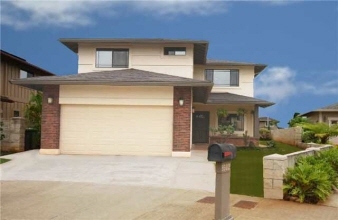 Cul-De-Sac Location, No Back Neighbor And Located Less Than One Minute From Mililani Ike.